water from all sides. 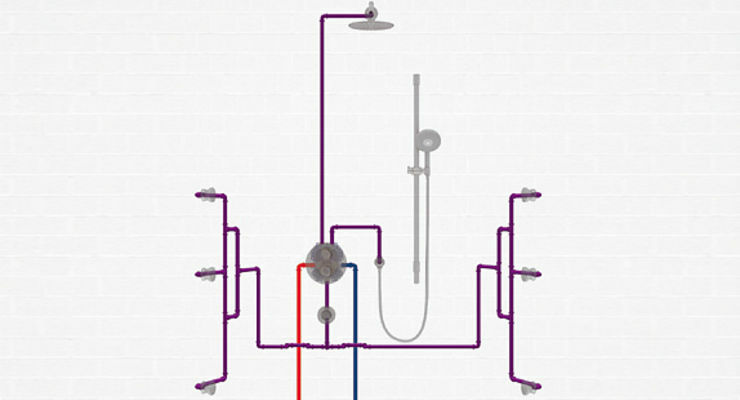 Comfortable - the GROHE Aquadimmer is an operating lever that allows choosing between the overhead and hand shower and controls the flow rate at the same time. To ensure flawless function of the side showers, a 3/4” stop valve is recommended as a minimum. Equipped with the latest GROHE technology, the GROHE Rapido T concealed thermostat provides a flow rate of over 50 litres per minute at a pressure of 3 bar. This guarantees an optimum supply of water to the side showers. When dimensioning the drain, make sure that the maximum amount of water produced can run off safely. Operating this shower with an instantaneous water heater is not recommended. The hot water storage tank should be sufficiently large. When the overhead shower and the side showers are used at the same time, up to 360 litres of hot/cold water are needed in 10 minutes.